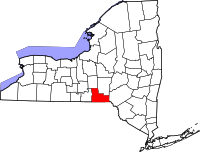 Broome County is a county in the U.S. state of New York. As of the 2010 census, 200,600 people lived there. Its county seat is Binghamton. The county was named in honor of John Broome, who was lieutenant governor in 1806 when Broome County was founded. Broome County is the site of Binghamton University, one of four university centers in the State University of New York (SUNY) system. ↑ "U.S. Census Bureau QuickFacts: Broome County, New York". Census Bureau QuickFacts. Retrieved 23 April 2018. This page was last changed on 24 September 2018, at 16:12.